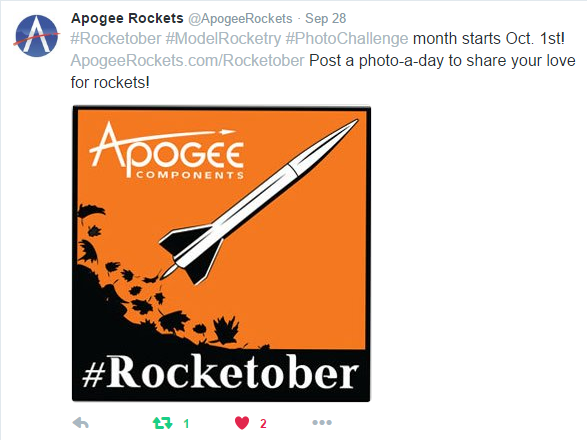 For the month of October, Apogee is holding a model rocketry photo blitz challenge on Twitter and other social media platforms. I think this is a great idea! I'm convinced that model and high power rocketry are not only alive and well, but growing. Still, it does seem to be a somewhat underground (ironically) pursuit. Model rocketry doesn't seem to have the public profile it had in the 1960s-80s. Just three years ago, when I saw a model rocket kit at Target, I was surprised that "people still do that." Whenever I tell a new person that this is my hobby, they are always surprised. Most of them have never heard of it. A small few suddenly remember doing it as kids. 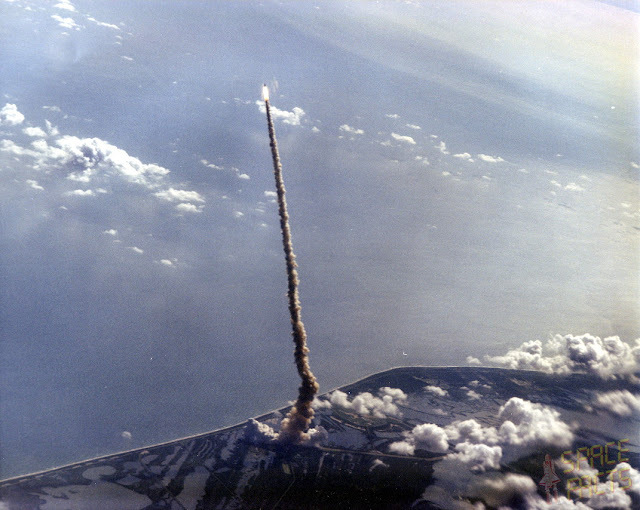 But rocketry is a hobby that I think a lot more people would enjoy if they knew about it and tried it out. 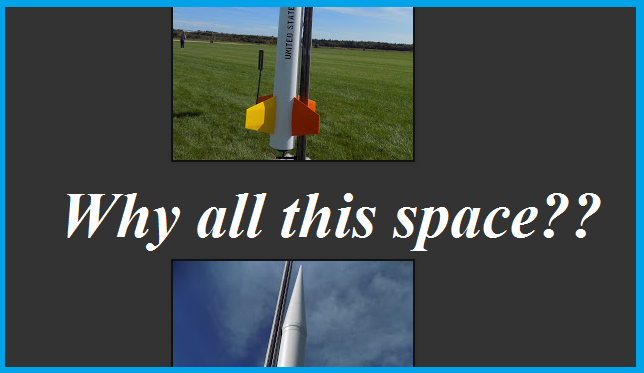 A social media campaign might be a cool way of spreading awareness of rocketry. 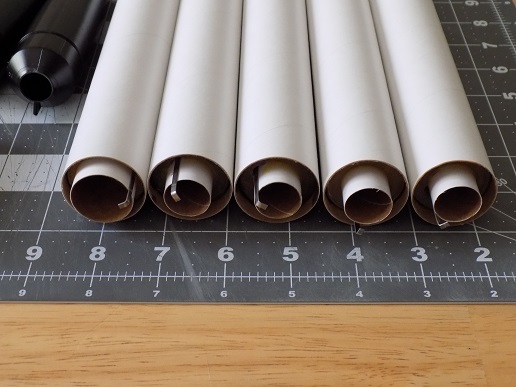 My Twitter account is devoted solely to rocketry in general, and this blog in particular. But a lot of people have personal or professional Twitter accounts. One person I've started following recently is Sharon Robinson, who is not only the acting Joint Head of Conservation and Collection Care at the Museum of London, but also a passionate rocketeer and prolific builder. 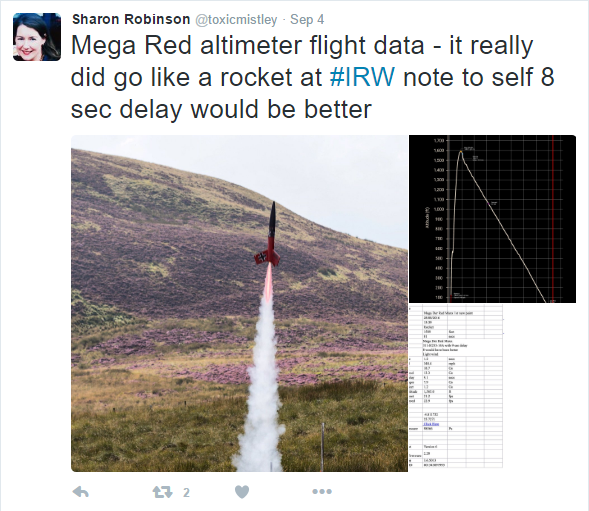 It's great to see someone sharing her love of rocketry alongside her other personal and professional activities. The idea of the photo blitz is to tweet a rocketry photo every day in October, and tag the photo with the hashtag #Rocketober. Not a bad idea to add #ModelRocketry or #HPR to increase the engagement of the tweet (the likelihood it will be seen and shared). 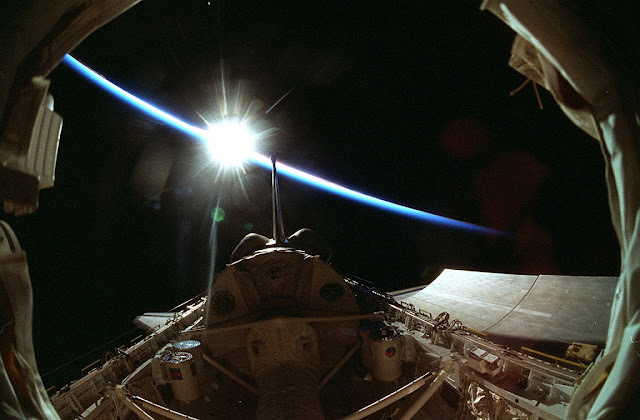 Apogee will re-post their favorite photos each day. And they've come up with a theme, which you can read about here. Of course, you don't have to follow the theme, and you can post more than one photo a day. I plan on posting one Apogee theme-based photo each day, and a ton of others as well. And while I'm at it, I'll probably post them here as microposts, without much explanation. For every photo I post on this blog, I take probably 50-100. Some are meant for later posts, some are duplicates to make sure I get the shot. And some are great, but I never find a use for them here. And there's no reason not to post #Rocketober photos on Facebook or Instagram as well, if you are on those social media platforms. Both of those support hashtags, which can be a good way for people to find things that interest them. I hope you join me (and Apogee) in tweeting tons of rocket pics. It'll be great to see them, and re-tweet or share them. Let's see if we can get rocketry to trend! Note: A search of the term #Rocketober brings up a few rocket-related posts from previous years, including one photo I found of a Saturn IB, as well as a couple having something to do with yoga. Who knew? Tonight, we are recording a much-anticipated episode for the new season of The Rocketry Show podcast. Tonight, we are talking with an astronaut. 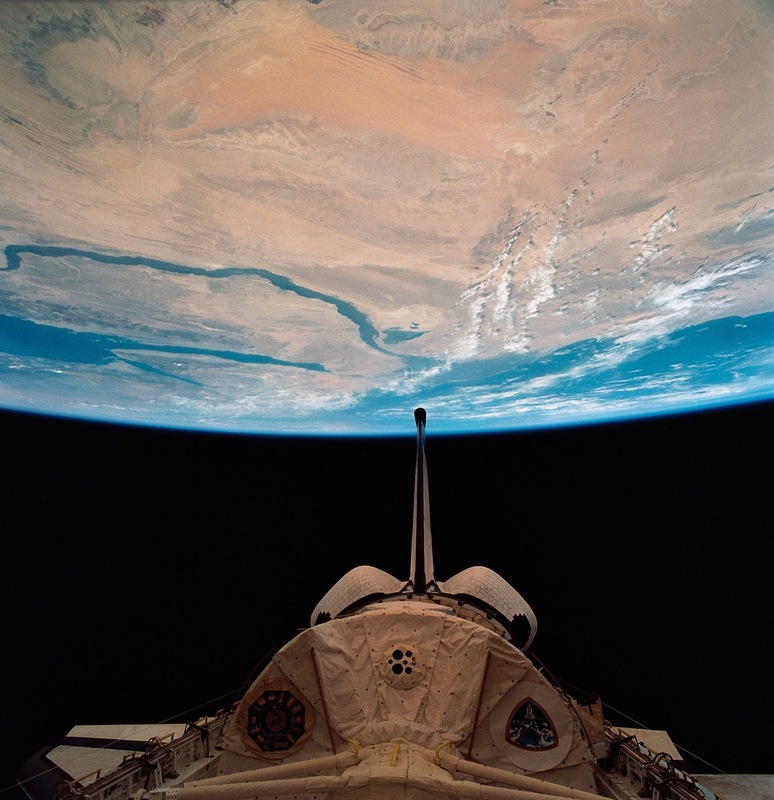 I can't say who it is until the show is posted, but this astronaut flew three times on the Space Shuttle, serving as pilot twice and mission commander once. Those are all the clues I can give you for now. I'm both excited and nervous. I'm sure it will be great. But on some episodes, as I'm the n00b of the group, we have certain guests where I can't think of an intelligent question to ask, and I usually say very little. I'm sure this guest will be great though. I may not have to ask anything at all. But I think I do have one reasonably intelligent question. I hope that I don't forget to ask it - or that CG or Gheem ask it first! 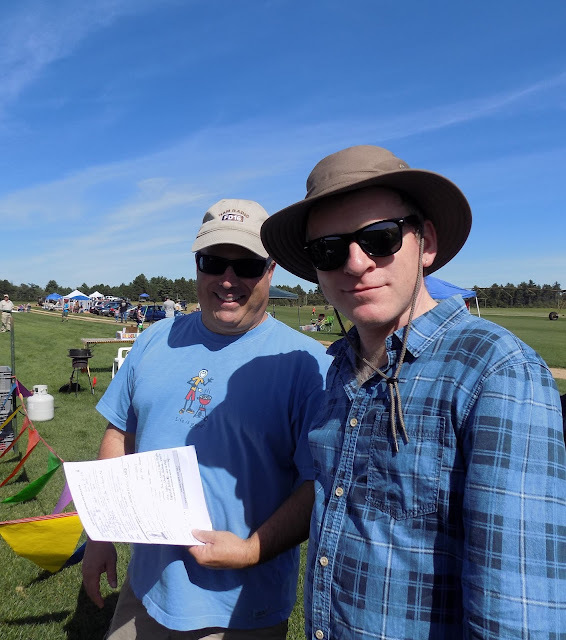 The launch video of my successful high power rocketry Level 1 certification attempt is now on YouTube. The rocket gets pretty tiny when it gets up there, so this is best viewed in full screen mode. I'm in the process of updating the Fleet page. If you ever read this blog and notice some weird spacing issues, let me tell you that this happens all the time. Whenever I write a post or update a page, after I've published it, I have to go back several times and fix spacing issues. Blogger always inserts or deletes spaces before or after images, and I have to edit the post, re-adjust everything, save the post, and look at it all over again. There are some spacing issues I can never seem to fix. "@rocketn00b Can you tell me which spray adhesive you use to stick sandpaper to your aluminum sanding block so it isn't permanently stuck?" Mark is referring to one of my favorite tools, the Great Planes Easy Touch hand sander. I first found out about this on Chris Michielssen's excellent Model Rocket Building blog, and it's a terrific sander. If you don't have one, I highly recommend it. I have two, so I can easily switch between coarser and finer grits of sandpaper. The Great Planes sander comes with a few sheets of self-adhesive sandpaper, and you can buy more from them, but only in coarser grits. If you want to use a finer grit (say, 320 or 400), you have a few options. The first is to cut regular sandpaper to size and apply it with spray adhesive. The other is to buy self-adhesive rolls. A great resource for this is Klingspoor's Woodworking Shop. The adhesive on this sandpaper is really strong, and after reading a recent post on Model Rocket Building, I realized I wasn't alone in having trouble getting old sandpaper off the block. But I recently figured out the trick, so I thought I'd share it here. First of all, to answer the Twitter question, any spray adhesive will probably do. Most of them loosen their grip in water, so soaking the sander for a few minutes should do it. But with the Klingspoor paper, that doesn't quite work. This stuff holds really strong. You may try to peel with your fingernails, and end up using some kind of putty knife or scraper, but still the paper tears, leaving lots of sandpaper and adhesive behind which takes a lot of work to remove. But you can cleanly remove stuck on sandpaper from an aluminum block with little effort using warm, running water. Start by running a stream of warm water directly onto the edge of one corner of the sander. After a few moments, that corner will loosen up and you will be able to carefully peel it away from the sanding block. Allow the warm water to continually flow right onto the seam between the sandpaper and the sanding block. With a firm grip, slowly peel the sandpaper from the block. You may find that the sanding block is now completely clean. More than likely, however, there will be a few small spots of adhesive still stuck to the block. An adhesive remover will take care of that. Goo Gone will work well. I personally like using Ronsonol Lighter Fluid. It breaks down adhesives but doesn't leave a lot of greasy residue. Just apply a layer of the lighter fluid to the sanding block and allow it to soak in briefly. The remaining adhesive will wipe cleanly off the sanding block with a cotton ball or swab. Rinse the sanding block and dry with a paper towel. It should be clean and ready for more sandpaper. I did it! I got my Level 1 high power rocketry certification! This means that I can now purchase and fly H and I impulse rocket motors! Yesterday's 14th Annual FlisKits Anniversary Launch in Berwick, Maine, was incredible. The field is huge and flat, and despite the breeze, most people got all their rockets back. I took a total of 10 rockets with me, but only flew three. Those three flights, however, were spectacular. I flew the Estes Nike Smoke and the Ventris on Estes G40 composite motors. But my first flight of the day was the certification flight, which I did with the Estes Leviathan. I decided to do that one first, so I could get over my nerves and just have fun the rest of the day. I'm still waiting for some pictures, and need to edit video, but here are the photos of the preparation I did for flight. The motor I used was a Cesaroni H133 composite reload. The motor comes with a 14-second delay. 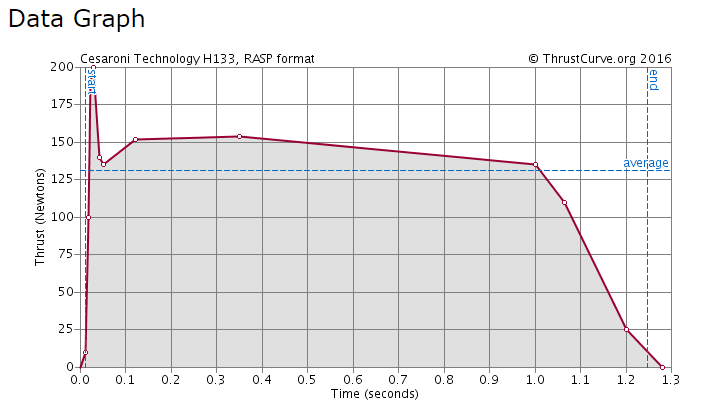 The H133 burns for about 1.2 seconds. 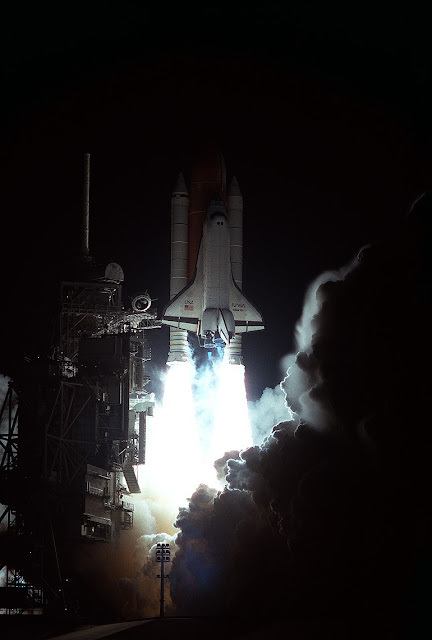 Its average thrust is 133 newtons, but its peak thrust is around 200 newtons. read the instructions. They come wrapped around the motor. Siting on the folder is the delay grain. Next to the folder is a delay drilling tool. 14 seconds is too long a delay for this flight. I need about 9 seconds' delay between motor burnout and ejection of the recovery system. the delay grain and twist and twist, drilling out material until the tool won't go any further. I've removed just enough material from the center of the delay grain to make it burn for only 9 seconds. After returning the delay grain to the motor liner, I insert the whole reload - delay grain first - into the aluminum casing. Next, I insert the motor into the rocket and screw on the Quick Release motor retainer. Then I tape the igniter to the rocket so I won't lose it on the way to the launch pad. 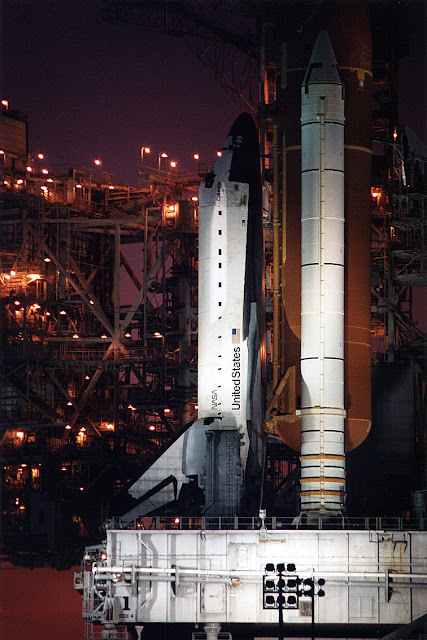 With high power motors, you're not supposed to insert the igniter until the rocket is on the pad. I pull off the nose cone and unpack the recovery system, so that I can re-pack it properly. Folding the parachute on the table proved an impossible task in the wind, so I moved to the ground for this step. After folding the chute, I attached the Jolly Logic Chute Release. My simulations told me the rocket would fly between 2010 and 2090 feet high. I don't want the chute to open at apogee, or I might have a long walk to recover the rocket. I set the Chute Release to open at 400 feet. Finally, I re-pack the recovery system. Although I've packed a little cellulose insulation into the rocket as wadding - rocketeers commonly refer to this as "dog barf" - I use added protection for the parachute and Jolly Logic Chute Release. This is a flame-retardant Nomex parachute protector. 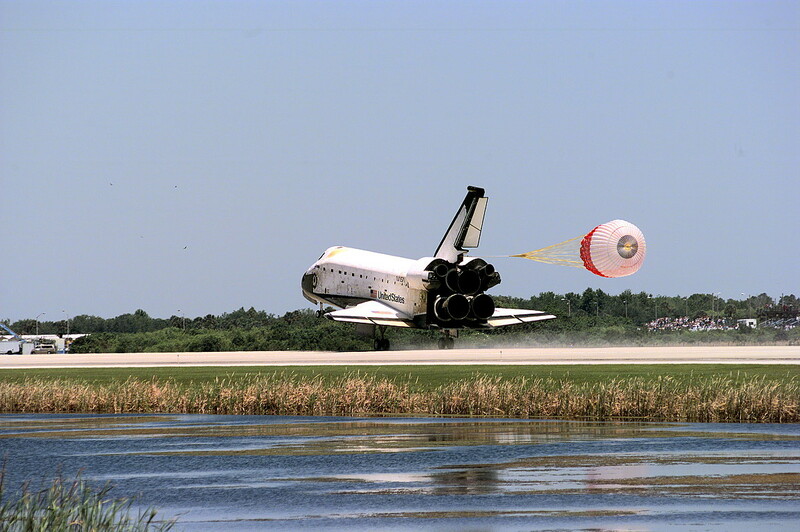 I wrap the chute and Chute Release in what rocketeers refer to as a "burrito." It's not the most neatly-folded burrito, but it will do the trick. Some rocketeers rely solely on a Nomex sheet. While it does work, Nomex can burn through after a few flights. A combination of Nomex and cellulose "dog barf" wadding increases chances of a successful recovery. I used a dowel to push the recovery system down into the rocket so I could get the nose cone all the way on. Level 1 certification application, and Ron, one of my flight witnesses. The Leviathan is a nice, big kit. I'm pretty proud of how it turned out! It looks great on the pad! Ready and awaiting countdown and launch! Video and photos of launch and recovery coming soon!